The Supreme Court on Friday reserved its judgment on the question whether it's 1994 ruling in Ismail Faruqui Vs Union of India requires reconsideration by a larger bench. 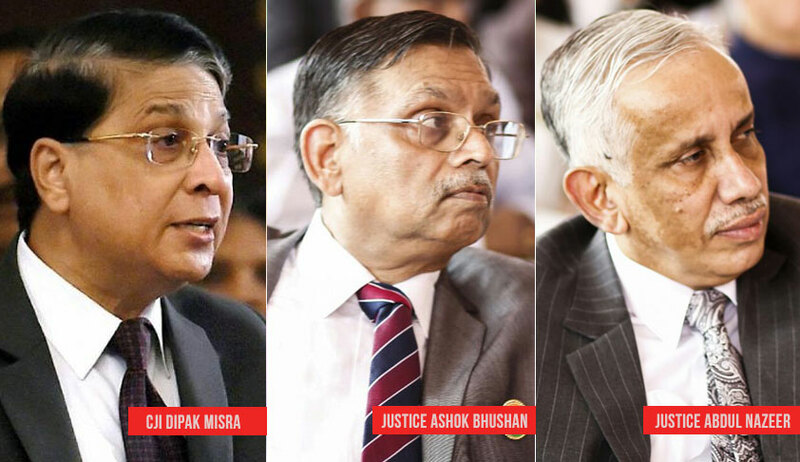 The bench of Chief Justice Dipak Misra, Justice Ashok Bhushan and Justice Abdul Nazeer was hearing a string of appeals against the 2010 verdict of the Allahabad High Court in the Ram Janmabhumi-Babri Masjid dispute. On previous occasions Senior Counsel Rajeev Dhavan, for the Sunni Waqf Board, has pressed for a reference to a constitution bench of the 1994 apex court judgment in as much as it observes that a mosque is not an essential part of Islam and that the namaz may even be offered in the open. It has been his case that the “questionable” remarks in Ismail Faruqui have infiltrated the judgment of the trial court. Indicating Sajjadanashin Sayed v. Musa Dadabhai Ummer (2000), he repeated that in spite of an issue and a decision in an earlier case, the finding may be treated as being only collaterally or incidentally in issue and not res judicata. Reliance was placed on Syed Mohd. v. Mohd. Hanifa (1976), where it was noted that the pleadings have to be examined to ascertain if the question decided was the question ‘directly and substantially in issue’. Dr. Dhavan asserted that what is invoked now is a pure question of law as to what essential practices are and how they are to be proved. Further, he submitted that where the decision is on a pure question of law, then res judicata does not preclude a Court from deciding such question differently. In this behalf, he invited the bench to peruse a catena of precedents- Mathura Prasad Bajoo Jaiswal v. Dossibai N.B Jeejeebbhoy (1970), Satyendra Kumar v. Raj Nath Dubey (2016), Gopakumar B. Nair v. Central Bureau of Investigation (2014), The Mysore State Electricity Board v. Bangalore Woollen, Cotton and Silk Mills Ltd. & Ors. (1962) and the most recent Canara Bank v. N.G. Subbaraya Setty (2018). He once again referred to the order of the Supreme Court of September 24, 1993, by virtue of which it had transferred from the Allahabad High Court to itself certain writ petitions challenging the constitutionality of the Acquisition of Certain Areas at Ayodhya Act of 1993, the statute having resulted in the abatement of the original suits. He emphasised that the apex court had, in the interim, stayed the hearing before the High Court on the issue as to whether the suits had abated or survived. “(‘Comparative significance’ and ‘particular significance’) may be a factor in the acquisition, but not in context of two religions to say that a temple trumps a mosque...you cannot compare the two...that mosque had been there since 1526 till 1992...was there a temple then? No. They just had a right to pray, which was confirmed only in 1885...that is it”, Dr. Dhavan continued. “(The concept of ‘particular significance’) is violative of the principle of secularism, the Constitution and the doctrine of essential practices...to first require them to show that (a place of worship) is an essential part of the religion for it to be entitled to the protection of Article 25 is wrong law...all mosques are to be protected, provided they are bonafide, he argued. However, in so far as, in Ismail Faruqui, the apex court has analysed the ‘comparative use’ of the disputed area and the right of worship practised there to determine if the mandate in the 1993 Act to maintain the status quo as existing at the site on January 7, 1993, was a slant in favour of the Hindu community, Dr. Dhavan has no objections. “‘Comparative use’ is used in context of the injunctive relief and I understand that...these people had been praying there since 1959...so I do not attack the reliance on ‘comparative use’ for the injunctive relief...”, he said. Next, Dr. Dhavan urged that, in Ismail Faruqui, no exercise of examining the tenets of the Islamic faith and any evidence of the conscience of the community was undertaken to determine what practice may qualify as being essential or integral to the religion. It was his submission that the Shirur Mutt (1954) and Tilkayat (1963) cases read together depict how an essential practice is to be ascertained. “I am not concerned with whether they are right or we are, I am concerned about the jurisprudence of this court...the right under Article 25 is to be examined based on the evidence that is adduced...this was not done and that has damaged the case...we are dealing with Fundamental Rights...’Do you have that Fundamental Right’, is the question...secularity is at stake...public order, health and morality are to be protected”, was his plea. On Friday, Dr. Dhavan again criticised the pilgrimage test suggested by Senior Counsel K. Parasaran, distinguishing between the Hindu faith, as having its sites of pilgrimage within India, and the other faiths of Islam and Christianity, their pilgrimage being outside of India. “There cannot be a classification based on the location of the place of pilgrimage inside or outside of India...can you require (a community) to first show how a place of worship is of ‘particular significance’ and then, require it to be in India, for it to cross the threshold of Article 25? Can you say that you will be protected only if your values come from the Indus to the Indian Ocean? Even if this happens to be the country with the third largest Muslim population in the world?”, inquired the Senior Counsel rhetorically. Continuing in the same thread, he mentioned former Chief Justice B. N. Kirpal’s observation on India’s ethnic diversity in the 2002 judgment of T. M.A Pai Foundation. “The right to prayer (at the disputed site) lives irrespective of the demolition of the mosque...this is how it has to be read”, advanced Dr. Dhavan.